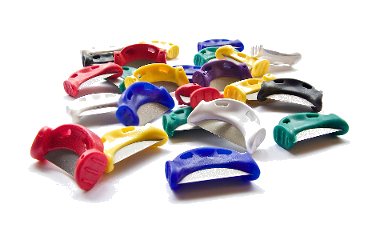 The depth-limiting design of QwikStrips prevents soft-tissue irritation, while the unique handle design provides a comfortable grip for optimal tactile control, giving easy access to tight anterior or posterior spaces. Qwikstrips are color coded and are available in either serrated or abrasive strips with the following grit types: extra course, course, medium, fine, and super fine. *They make cement removal easier and safer after cementation of crowns, bridges, inlays, onlays or veneers. *Hygienists can use them for removing stains that their instuments can't reach. *Enable smooth finishing of interproximal composites or amalgams. *Reduce tight contacts to enable complete seating of crowns, bridges, inlays onlays or veneers. The entire QwikStrip™ product line puts confidence at your fingertips. 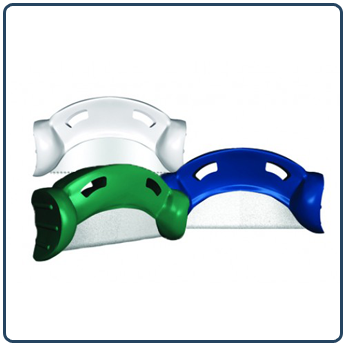 They are easy to handle, and will enable cement removal, finishing and polishing, or IPR in either the anterior or the posterior of the mouth. QwikStrip™ Serrated Strips are designed to make crown and bridge clean-up quick, safe, and simple after cementation of crowns, veneers, bridges, inlays, or onlays. Clean up will never be this easy! QwikStrip™ single-Sided Abrasive Strips can be used in the anterior OR the posterior of the mouth. However, the QwikStrip™ Curved Abrasive Strips are perfect for the posterior as they follow the contour of the teeth more apropriately. 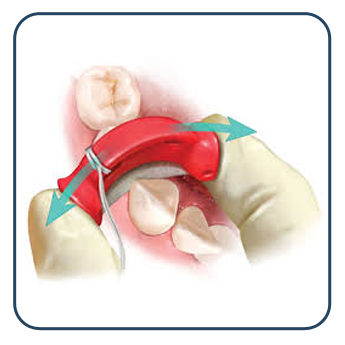 When used for IPR during orthodontic procedures, use QwikStrip™ Single-Sided, Curved, and Double-Sided Abrasive Strips. For spaces from .07mm to .2mm, use the Single-Sided QwikStrip™ Abrasive Strips (straight or curved); For spaces from .2mm up to .5mm, use the Double-Sided QwikStrip™ Abrasive Strips. Together, you can create as little or as much space as needed. Choose from three different types of QwikStrips to use during your IPR procedures. With the original single-sided abrasive strips, you simply and precisely create IPR as needed up to 0.2 mm. When more IPR is needed, our double-sided abrasive strips enable you to open up contacts up to 0.5 mm. Our double-sided QwikStrips have set the bar in the Industry! Our curved abrasive strips are perfect for finishing and stripping the posterior teeth. Due to the patented anatomical design of these curved strips, the contour of the posterior teeth is maintained during finishing or stripping procedures.